With the United Nations debating an expanded role in Iraq, a suicide bomber, his body wrapped in explosives and his car filled with 50 pounds of TNT, struck a police checkpoint outside U.N. headquarters in Baghdad on Monday, killing an Iraqi policeman and himself. Nineteen people, including two U.N. workers, were wounded in the attack. A U.S. military spokesman at the scene said the bomber was trying to get into the U.N. compound at the Canal Hotel, where a massive truck bomb a month ago killed 23 people including the top U.N. envoy to Iraq, Sergio Vieira de Mello. The bomber was blocked at a newly established police checkpoint on a street in back of the compound. As police inspected the bomber's car, he detonated the explosives. The detached arm of a blast victim lay more than 100 yards away. The hood of the bomber's car was blown 200 yards distant. Authorities identified the slain policeman as 23-year-old Salam Mohammed. A U.N. official, speaking on condition of anonymity, said six people had not been accounted for. Appearing on CBS News' The Early Show, U.S. Administrator for Iraq Paul L. Bremer said attacks like the one Monday in Baghdad are just a small part of a larger picture. He said there are many positive developments to focus on, including Iraqi schools and hospitals re-opening. Bremer also insisted that Iraq is not yet ready for self-government and defended the pace of U.S. efforts. "We're not dragging our feet," Bremer said on The Early Show. "We're ready to go as soon as there is a legitimate Iraqi government." President Bush is set to defend the U.S.-led invasion of Iraq when he addresses the United Nations Tuesday, but he says he's open to the possibility of giving the world body a role in overseeing postwar elections. Still, Mr. Bush in an interview taped Sunday with Fox News said he's not sure the United States will have to yield a significantly larger role to make way for a new U.N. resolution on Iraq. Iraq's long-awaited return to the OPEC fold may dominate headlines when the cartel meets this week, but it probably won't have much impact on the organization's output policy for the next few months. With Iraq's recovery taking much longer than expected, several OPEC members have said the group should hold production steady for now. Aquila al-Hashimi, one of three women on the Iraqi Governing Council, was reported to be improving Monday, two days after an assassination attempt near her home in western Baghdad. The Governing Council president, Ahmad Chalabi, blamed remnants of the regime of Saddam Hussein, whose government was toppled by U.S.-led forces in April. Praising new security arrangements around the hotel, a U.S. military officer at the scene credited the Iraq police with preventing an even greater tragedy. "I reiterate that he was not through the checkpoint, and he was not near the U.N. compound. That means security is working," said Capt. Sean Kirley of the U.S. 2nd Armored Cavalry Regiment. 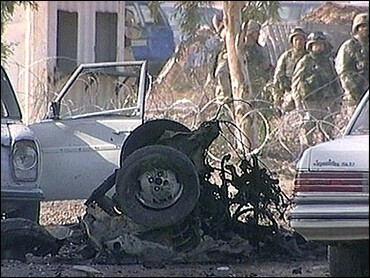 Kirley said the Iraq police had a warning of the attack shortly before it happened. He would not elaborate. The bomb exploded about 200 yards from any of the buildings or mobile offices inside the compound and about 400 yards from the hotel building itself. The truck bomb last month was parked outside the front of the hotel just yards from Vieira de Mello's office, when it exploded and brought down the facade, trapping him and several others alive in the rubble. Before he died, de Mello told rescuers that he hoped the explosion would not cause the U.N. to pull its mission out of the violent Iraqi capital. But at the U.N. headquarters in New York the future of the world body's operation in Baghdad is under study. "This incident today once again underlines that Iraq remains a war zone and a high risk environment, particularly for those working to improve the lives of the Iraqi people," Kevin Kennedy, the top U.N. official in Baghdad, said in a statement. Iraqi police Master Sgt. Hassan al-Saadi, among the first on the scene after the explosion, said he was told by injured policemen that a gray 1995 Opel with Baghdad license plates approached the entrance to the parking. "A guard went to search the car, opened the trunk and the car exploded, killing him and the driver. When I arrived, there was fire and smoke, even the guard's body was ablaze," he said. An Iraqi workman who was slightly injured said he saw cars trying to enter the rear parking lot when one of them exploded. "It was as if I was being pushed and thrown three meters (three yards) from where I was standing," the worker, Wissam Majid, said. "I saw fire and smoke. I started running away and then I lost consciousness." The blast, which could be heard over much of the Iraqi capital, took place one day before President Bush is to address the U.N. General Assembly. He was expected to offer an expanded role in rebuilding Iraq, a condition set by many nations for contributing peacekeepers and money to the reconstruction effort. Secretary-General Kofi Annan has said he wants assurances of security for U.N. personnel in Baghdad along with any expanded role. The United Nations sharply reduced its work in Iraq after the Aug. 19 bombing. At the time of the attack, U.N. spokesman Fred Eckhard said there were about 300 international staff in Baghdad and more than 300 elsewhere in Iraq. These numbers are thought to have now been dramatically reduced. U.N. officials contacted Monday refused to say how many foreign staffers remain in the country, citing security. The bomb exploded two days after an assassination attempt against Aquila al-Hashimi, one of three women on the Iraqi Governing Council and a leading candidate to become Iraq's U.N. ambassador if the interim government wins approval to take the country's U.N. seat. Since Mr. Bush declared an end to major combat operations on May 1, more than 160 American soldiers have been killed. More than 300 U.S. soldiers have died in Iraq since the U.S.-led coalition launched military operations March 20.